There is no better way to discover the legendary landscape of the Bluegrass Region than driving or cycling the country roads around the Horse Capital of the World. Lush pastures, mile after mile of plank and stone fencing, horses grazing, magnificent homes and barns: all this and more is there for your viewing pleasure! Love to walk? A variety of tour companies offer guided tours of downtown Lexington on foot. See the Biking and Cycling Thru the Centuries links to the left to learn more about cycling in the Bluegrass. 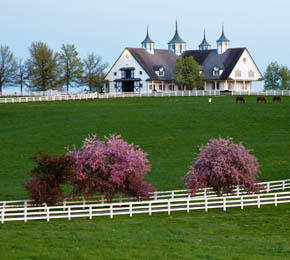 The Lexington Walk and Bluegrass Country Driving Tour. This large format annotated paper map is one of our most frequently requested publications, and it&apos;s free. Call (800) 845-3959 or order online, and we&apos;ll mail you one. If you are in Lexington, stop by the Visitors Center and pick one up. Many hotels keep this map on hand for guests. Bluegrass Country Driving Tour: This popular route is divided into three parts. Take a morning or an afternoon and do the whole thing, or just pick the circuit that interests you the most. There&apos;s easy access back to town after each circuit. You&apos;ll learn about the history and geography of the area and -of course- about our world-renowned horse industry. The Lexington Walk: On the reverse side is a walking tour of historic downtown Lexington with 33 points of interest. It is best enjoyed on foot, but it can also be driven. There are plenty of places to stop and rest, or eat, along the route. You&apos;ll see first hand the charming mix of old and new buildings that comprise the compact downtown core of Kentucky&apos;s second largest city. Want to know about gas prices in Lexington? Click here. Available through the App Store, this free walking tour app focuses on the area around Lexington&apos;s Old Fayette County Courthouse. For more than 200 years, downtown commerce has been conducted in buildings designed by talented architects and constructed by skilled craftsmen. Download the app, pop in your earbuds, and enjoy listening to cultural geographer Karl Raitz talk about a fascinating selection of historical buildings. Photography by Richard Greissman.